Each Wooden Christmas ornament on this page is hand carved by chisel. Carved Wooden ornaments make wonderful gifts that will provide many cherished memories down through the years. They are one of a kind works due to the very nature of wood carving. Should you see a carving that strikes your eye and it has already been sold, don't panic - just ask Tom if he can carve something similar. If the PayPal button is there - the ornament is in stock and ready for delivery. Please do not increase quantities in your shopping cart or your order will be refunded - each is a one of a kind - e-mail us for custom work! He's signed on the rear brim of his cap. This is one Santa ornament guaranteed to bring smiles on Christmas every year! About 4.25" in height, this Santa bust Christmas ornament has loads of character. The carved facets of the beard are accented by the light brown antiquing that gives this wooden ornament a soft, warm glow. Signed and dated 2005 - we're betting he'll be on front of the tree for years to come! At 4" in height, with a long pointy beard, this wooden Christmas ornament is a genuine carved Icicle! His Christmas Red hat has antique white trim and his long white beard is another example of Tom's warm antiquing technique. A skinny little fellow, he's certain to look great on your old world style tree! Just under 3.25" in height it is always amazing to me how Tom can use a large chisel to carve this amount of detail. In a Christmas Red pull over - (has to be, there are no seams) - with hunter green gloves, the expression on this little ornament always makes me laugh. A wonderful Christmas ornament that should have a good home so he can be cherished! This Santa ornament is only 3.5" tall, but really grabs your attention when he's on the tree. The V grooves in Santa's antique white beard are heavily accented with brown antiquing, making him appear to be a vintage carving, when in reality he was carved in the fall of 2005. As with all of Tom's wooden Christmas ornament carvings, he is carved in the round (all sides) and the detail is amazing! Not really, but the antiquing soaked into the basswood leaving the impression that Santa surprised someone as he was coming down the chimney! A very small Santa, standing only 2.5" tall. With his dark tapestry wine coat and hat, he will remind those that gaze upon him of a simpler time, when Christmas was about family and friends gathering for good cheer! The deep burgundy red of this Santa's coat was brightened by the flash - and there is a reason Tom is a carver and not a photographer! At 3" in height - he's no basketball player, but you will be amazed at the details as you run your fingers over this work of hand carved Christmas art! Give this Santa as a present, or attach him to the package ribbon. Either way, whoever receives him will appreciate and cherish this little elf! This Icicle Santa is almost 4.75" in length. Although he's a skinny little guy - he's actually deeper than you would expect. Hang him on the corner of the tree and people will comment on the change of appearance as they pass by! The mark of a good wood carving, you will find your hands caressing this carved ornament and admiring the finish of the wood. 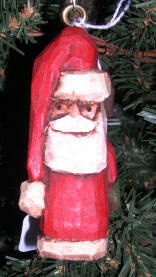 The winding, twisted beard is a classic style of carving Santa's beard to create an icicle ornament. Tom's rendition provides a primitive feel to create a unique bit of character. Santa's bust is just over 4.75" tall (which does not include the brass screw eye) and will be very visible on the Christmas Tree.